The MINIFLEX5-BFIII from I-PEX is a tough and robust pitch back-lock connector with dust cover function, developed for industrial, domotic and automotive applications. 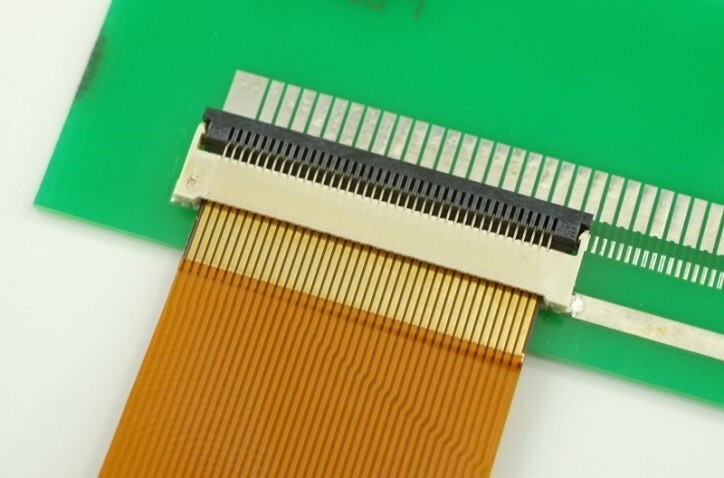 This 2.2mm profile height and 0.5mm pitch FFC/FPC connector was designed with a back lock type and top and bottom contact. This connector is fully compatible with OMRON XF2M connector. There are various technical advantages to this connector. A 1.35mm wiping length insures reliable contact is associated with high FPC retention force (23,80N). For this connector, I-PEX kept the same guiding principle as its other connectors. When the actuator is locked, the actuator functions as a full cover to protect contact damage when opening, and also preventing dust contamination and short circuit. The under part of the connector housing has no contact appearance, making it available to design PCB patterns under the connector. If connector actuator was closed accidentally without FPC inserted, the connector will still work reliably. The insertion force of the connector goes up (from 0.062N, initially to 0.356 N (average)) and the retention force of the connector will not change. Pin count range is from 10 to 60 contacts and 10, 20, 22, 30, 34, 36, 40, 45, 50 and 60 contacts are already available. This connector has been developed as a complement to the existing EVAFLEX series, the ‘unique auto-lock structure’.